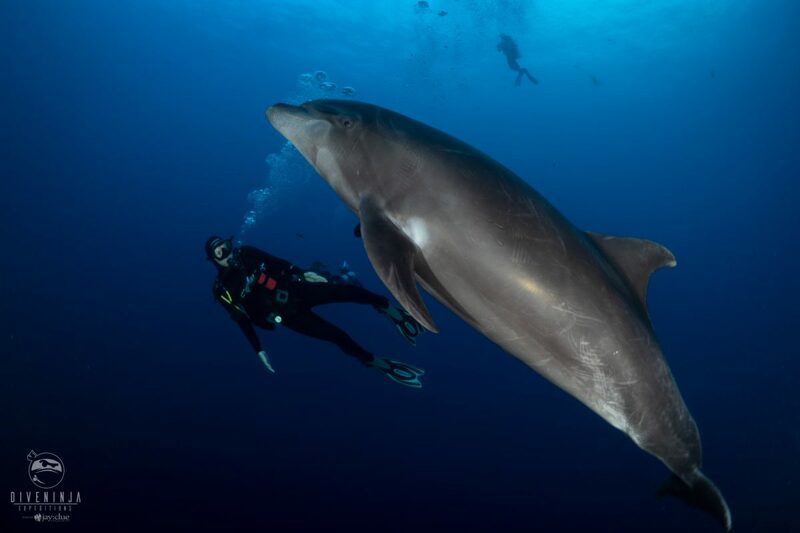 The Revillagigedo Archipelago is constantly named by divers as some of the best big animal diving on earth. This UNESCO World Heritage Site and one of the largest Marine Protected Areas in the world is located 240 miles off the coast of Mexico. The area is more commonly known by the name of its largest island – Isla Socorro. 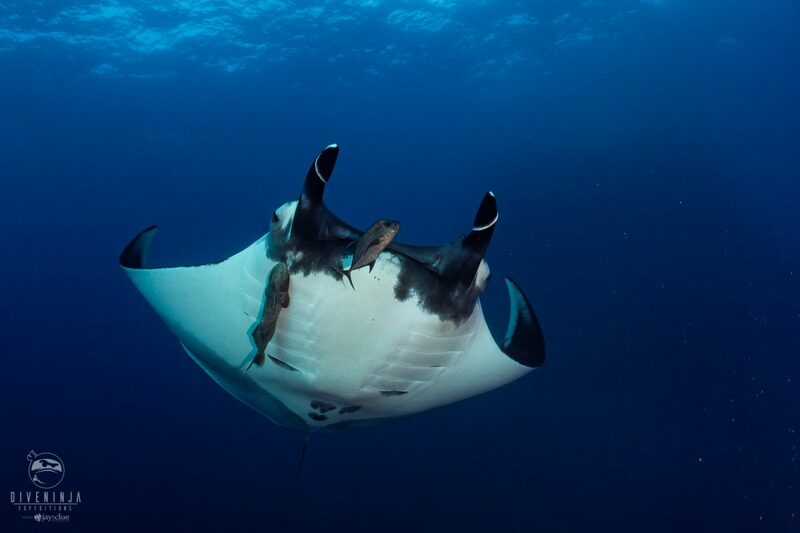 This is a place where mantas growing upwards of 7 meters wide (23 feet) are a common sight. A location where over 10 species of sharks can be spotted, friendly pods of dolphins join divers, and giant tuna can be seen hunting. But it is not just the abundance of pelagic marine life that makes this area so special. The interactions with these beautiful creatures at these unique islands are what underwater dreams are made of. I think it was best summed up by a close friend who said diving here is emotional. Imagine a massive oceanic manta ray spotting you from afar, and seeking you out. Swimming directly to your face to look you in the eye and then spending the next 20 minutes circling you as if she wants to begin a conversation. Picture pods of dolphins that actively seek out divers beckoning them to play. All the while white tip sharks gather in piles of 10s & 20s, schools of shy hammerheads create choreographed walls out in the blue, and huge tiger sharks patrol the depths. This is the Revillagigedo. Join Team Ninja as we partner with Girls That Scuba on January 17-25, 2020 for a special expedition to these beautiful islands. This is a limited offer trip with 18 spaces ONLY 3 SPACES LEFT available. Everyone is welcome to join, both male and female divers. We recommend that you act fast as this trip will sell out quick. Scroll down for more details on the trip, then register online now to secure your space. Feel free to contact us at [email protected] or +1-973-619-9976 with any questions or to reserve your space today. For this expedition we have chartered the Nautilus Undersea. She is a beautiful dive yacht whom some may remember from her IMAX & Cocos fame as part of the Undersea Hunter group. The Undersea has recently been completely overhauled and refurbished to match the level of quality of her sister ships in the Nautilus fleet. But unlike her larger sister ships the Undersea provides a more intimate experience. She is 32 meters (105 ft) long, has a 8m (24ft) beam, and comfortably holds 18 divers. She was built in the US for stability, comfort and is ISM safety certified. Her salon and dining area is comfortable and offers a full bar, comfy sofas, a computer workstation, a large flat screen TV, and satellite WiFi access. The dive deck is large and offers individual storage as well as a spacious camera table. She has a partially covered al fresco lounge upstairs as well as a sundeck and a 6 person jacuzzi to unwind in as you take in the sun & sea breeze. The state rooms are comfy and offer ample storage, individual climate control, a TV monitor with media player, as well as private ensuite bathrooms. The double staterooms come in multiple varieties with a double and single bunk style, 2 single beds, or 1 queen bed. She also offers a quad room with 4 single beds for those looking to save a little. Additionally just off the dive deck she has an ADA compatible – accessible superior suite. Towards the bow she offers a large premium suite with big windows, tons of space, and the ability to be configured into either 2 smaller beds or 1 large bed for those looking to make the trip extra special. Our trip will begin at the Nautilus Hospitality Suite in sunny Cabo San Lucas, Mexico. For those arriving early we will be holding some special guest talks and workshops in the afternoon (TBA) before boarding the ship in the evening. We’ll set sail that night for the nearest of the islands, San Benedicto. The crossing to San Benedicto takes around 26 hours giving us plenty of time to for settling in, catching up with new friends, and learning about this unique area. Dive Ninjas founder, Jay Clue, will be on hand to give a presentation about their current conservation work & manta identification projects with the Pacific Manta Research Group. He’ll be explaining how you can help out & get involved during this trip, and maybe even be able to name a manta too. The weeks itinerary will take us through the 3 major islands from San Benedicto to Socorro and Roca Partida. We’ll aim to hit all the sites that make this area so famous including El Cañon, The Boiler, Roca Partida, Cabo Pearce, and more. With up to 4 dives per day you’ll have chances to see gigantic oceanic manta rays, bottlenose dolphins, and over 10 species of sharks including scalloped hammerheads, silver tips, white tips, black tips, silkies, Galapagos, dusky, tiger sharks, whale sharks, big yellowfin tuna, whales, and more. Plus for those interested we’ll have a special silky shark night snorkel. After 5 full days of diving we’ll begin the crossing back to Cabo San Lucas. On the return crossing Jay and the team will be on hand to help with manta identification submissions, photo tips, and more. We’ll wrap up the trip with a closing slideshow as well as the hilarity that is the Ninja Crap Fish Photography contest. The Nautilus Undersea offers 4 different room options. A standard double stateroom at $3,595* USD per person, a quad stateroom at $3,195* USD per person, the Rosario ADA compatible superior suite at $3,995* USD per person, and the Emerald Premium suite at $4,695* USD. All prices are per person and on shared occupancy basis. If you are traveling solo, no problem! We will match you with another solo ninja guest of the same gender. Or if you prefer your own private room a single supplement upgrade is also available for an additional fee. The trip price includes all diving & activities, AL80 tanks, weights, presentations, 8 nights accommodation on a shared basis, 4 delicious meals per day plus snacks, juices, soft drinks, tea, coffee, fresh towels in your stateroom as needed, as well as fresh towels on the dive deck for drying off between dives. Additionally Nautilus supplies every diver with a Nautilus LifeLine Marine Rescue GPS, a Dive Alert signaling device, and a SMB “safety sausage” to use on the trip. The price does not include flights, transfers from airport to/from ship, port & park fee of $65 USD payable at end of trip, alcoholic beverages/bar purchases, trip Nitrox upgrade ($100 per person – optional, but highly recommended), rental equipment, Crew Gratuity (10%-15% of trip price is customary but is at your discretion), 5% of MexicanIVA Tax*, or credit card processing fees. *Please note that Nautilus does not include 5% of Mexican VAT in their pricing. The Mexican IVA tax has been harmonized at 16% across Mexico. The original 11% tax is included in your trip fee. The 5% increase is charged additionally. This trip departs and returns from Cabo San Lucas located in the state of Baja California Sur, Mexico. The nearest airport is Los Cabos International Airport (airport code SJD) in San Jose del Cabo about a 40 minute taxi or bus ride away from Cabo San Lucas. We recommend arriving a day early to give you some time to relax and a little padding in case of any travel delays. Easy flights to Cabo can be found from many international airports in the US, Canada, and Europe as well as many other areas. From the US and Canada many direct flights can be found as well as some with a stop over in Houston, California, or Atlanta. From Europe you can either fly through the US or through Mexico City. Some airlines to check out are Alaska Air & AeroMexico (our personal favorites), United, and Virgin, but there are numerous others. And of course since you are visiting the birthplace of Dive Ninjas we recommend checking out some of the amazing things the area has to offer. 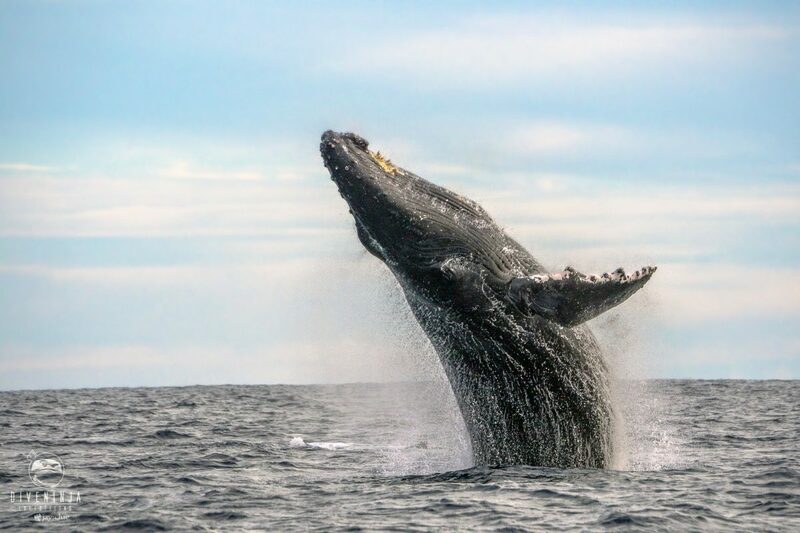 In January you have the peak of the humpback whale migration, mako sharks off the coast, our resident sea lions in Cabo & La Paz, whale sharks in La Paz, Bull Sharks in Cabo Pulmo, schools of cow nose rays in Cabo, hammers at Gordo, and so much more. We recommend checking out one of our Ninja Mini-Expeditions to get a taste of Baja as well as learning about the area or getting involved in some of the awesome conservation projects Team Ninja is working on. Interested in adding this to your Socorro expedition? Give us a shout and we can set it up for you.